I’m starting up a couple of weekly themed posts. I think they’ll help me keep up with the frequency of this blog as well as add some awesome content. This week, I’d like to introduce Wisdom Wednesday, where I’ll share a quote and discuss it. Let me know if you have a favorite quote or passage and I can feature it! 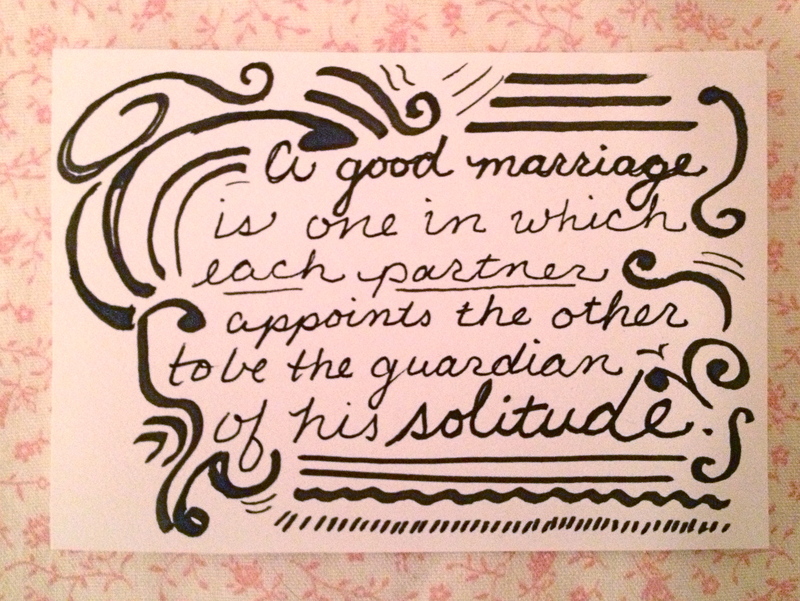 Rainer Maria Rilke’s views on marriage have been a fundamental part of my thinking on the subject. He makes the claim that two becoming one is an imperfect situation. In that situation, each party becomes less by entering into this relationship, and therefore, it’s a waste. Instead, he implores the recipient of this letter to view it as an opportunity to protect the solitude of the woman he’ll marry, and to expect that she’ll do the same for him. What better way to serve your spouse than to protect their solitude, their unique self, with all your being? What greater gift is there than allowing someone to be themselves fully and completely? This entry was posted in Uncategorized and tagged marriage, Rilke, solitude, Wisdom Wednesday. Bookmark the permalink.